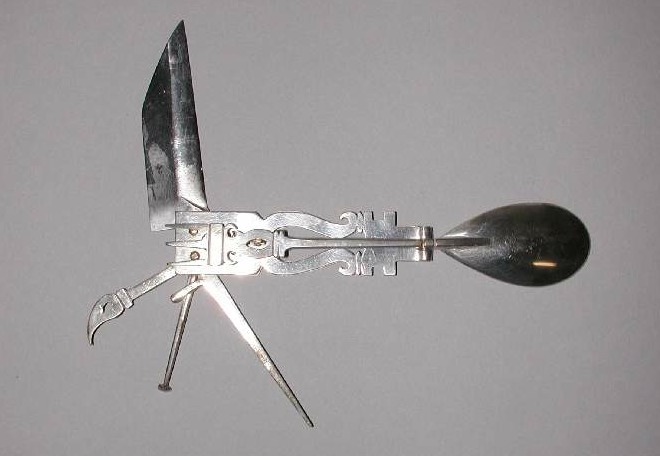 Did you know that the Romans invented the Swiss Army knife? I did not. This museum page has additional examples of what appears to have been a common Roman implement. During my recent visit to Seattle, I saw two sides of what many people experience as "public history". The first was Ye Olde Curiosity Shop. Located near the tourist destination of Pike Place Market, this century-old establish is an example of public history in a form that was once much more common. They have on display various items of the "freak show" variety (shrunken heads, deformed farm animals) as well as old-fashioned amusement machines (still operational!) such as an eighteenth-century animated diorama of a murder, and Stereoscope pictures. Of course it is primarily a retail establishment more than a museum, and they sell quite a range of items, from scrimshaw to candy. Most intriguing of their exhibits were the two "mummies" they had on display. They are both described as cases of natural environmental desiccation of a body. Their most famous, named "Sylvester" is as they describe it the body of a prospector, felled by a bullet, and found out West in the 1880s. He is naked but for some kind of cloth around his hips; judging from older photos it has been changed. A card gives their explanation of his history. He bears a visible bullet hole, and the scars from older injuries involving buckshot, but little is known about him. Interestingly, and contra the information on the wall beside him, some scientific analysis of Sylvester have suggested he is not what he seems. As this article details, there is evidence indicating that he was not a natural mummification at all, but was treated with an embalming technique involving arsenic. Intriguingly, the article says this was popular among late nineteenth-century sideshow exhibitors: perhaps he was created for public display? Next, to the more respectable end of public history, the Klondike Gold Rush National Historic Park. Obviously not in the Klondike, but in Seattle which was the starting point for a vast number of prospectors heading North in the stampede following the discovery of gold in 1897. In a downtown building, the former Cadillac Hotel, this museum is partly underground - suiting the mining theme. We were given a knowledgeable introduction by the Ranger on duty, Gene Ritzinger. He was wonderfully well informed about the history of the gold rush and the region. One display is a recreation of a provisions store: regulations put in place by the Canadian authorities decreed that everyone arriving in the Klondike had to be carrying supplies for one year. The museum is very well laid out, with something of interest for children and adults, with games like this "Strike it Rich". The informational chart, however, implies a gender parity of those heading for the goldfields, when in fact women were in the minority. Other activities including pencil rubbing of seals - this is a nice touch, and a way of providing something hands-on without resorting to stupid games. The information about particular miners includes artefacts like the diary and camera of William Shape (a wealthy New Yorker who seems to have gone for the adventure as much as the pursuit of gold). I also learned that John Nordstrom used the money he made in the goldfields to establish his first store in Seattle, which later became the major department store chain bearing his name. There is a documentary film about the gold rush from 1973 narrated by Hal Holbrook. It has colour photos (hand tinted, I assume) and also utilises the "Ken Burns" technique of moving focus across these images to tell the story. Engaging, and informative, without condescending to the viewer. The Klondike rush is an interesting phenomenon in itself - and not one I knew a great deal about beyond Jack London-esque images. The fact that it was very much a result of modern communications (that thousands of people knew of the gold discovery almost immediately, and the transcontinental railroad allowed them to quickly make their way to the West Coast - a great contrast with the slow journeys of '49ers). It was an arduous and unsuccessful journey for most - only 1 in 5 even made it as far as prospecting. Many of those who returned stayed in Seattle, and were able to memorialise the stampede by forming clubs, staying in touch - and becoming a civic force in their own right. Modern urban life and technology allowed them to make this event part of their public identity. The History News Network seeks nominations for its 2010 Cliopatria awards for best history blogs. Each year the award is given in the categories of Best Group Blog, Best Individual Blog, Best New Blog, Best Post, Best Series of Posts, and Best Writer. If you are a supporter of history blogging, please take a minute and nominate a few of your favorites. Northwest History won Best Individual blog in 2008, it was very gratifying and made a real positive difference in my career. Best Individual Blog: Boston 1775. Billed as "History, analysis, and unabashed gossip about the start of the American Revolution in Massachusetts," the blog is really much more than that. Blogger J.L. Bell does primary source blogging, reporting his latest historical discovery as is it were today's news. Along the way he provides a master class in the use on online primary databases. And he frequently promotes local history gatherings (I should do more of that) and offers a scholarly perspective on current events such as the Tea Party movement. When I won the Cliopatria two years ago my first thought was "Dang, J.L. Bell has been robbed!" Best Group Blog: Preservation Nation, the blog of the National Trust for Historic Preservation. It shows how an "official" blog of a major organization can be relevant and compelling. Of course if someone wanted to nominate Off the Wall, the National Council on Public History blog to which I contribute, I would not object. And by the way if you are looking for quality history blogs to add to your RSS feed you might take a look at past winners of the Cliopatria award.